I was left with a good quantity of Guittard white chocolate wafers after finishing my Opéra Cake for the Daring Bakers, not to mention 5 unaccounted-for egg yolks. That combination just screamed white chocolate ice cream to me, so I sent Jeremy to the grocery store for heavy cream with the promise of brownie sundaes for our Memorial Day dessert. Nolan has started to fall into a kind of natural schedule, which includes 5-7 hours of sleep overnight (sweet! ), lots of naps during the morning and early afternoon, and a very wide awake period from dinnertime straight through to about 1:00am. Making dinner these days generally means racing at top speed back and forth between the hot stove and the sobbing baby in the next room, culminating in a finished meal just as my timer goes off to pump milk. Sigh. So I had time during the afternoon to cook up the base for the ice cream, research potential brownie recipes, and blanch the ribs for dinner. Then I was sidetracked by a phone call from my cousin. When we hung up, Nolan was wide awake, wanting to be held, and dinner was off to a late start. Jeremy appeased the little guy long enough for me to get the ribs fried off and simmering in their sauce, then I popped him into his little throne on the kitchen table and stood next to him, making brownie batter at top speed and possibly breaking some sort of record in an effort to get them in the oven before he became inconsolable. With that sort of pressure, I turned to a brownie recipe I’ve made several times before, which doesn’t require unsweetened chocolate and produces perfectly ooey-gooey brownies every time. I further shortened the prep time by using bittersweet chocolate chips and the microwave, rather than chopped chocolate and a bain marie; I think the pan was in the oven baking within 5 minutes, and I just barely managed to squeeze in a past-due pumping session before they were done. In a microwave-safe bowl, combine the chocolate chips, butter and sugar. Microwave just until chips and butter are melted (for mine, I did 60 seconds at 80% power, stirred, then back in for 30 seconds at 60% power); stir with a wooden spoon to combine, then add the vanilla and salt. Beat in the eggs one at a time, then the flour, and stir just to combine; the batter should be thick and glossy. If desired, now is the time to add mix-ins like nuts or chocolate chunks. Pour into the prepared pan and bake for 20 minutes, until the brownies begin to pull away from the sides of the pan and the top is crinkly and appears dry; a toothpick inserted should still come out quite gooey. Cool for 10 minutes, then carefully remove from the pan using the parchment or foil edges and allow to cool to room temperature on a rack before cutting into squares. After dinner, I had another short reprieve to clean up the kitchen and get the ice cream churning. It came out a lovely ivory color and elusively flavored with cocoa butter. 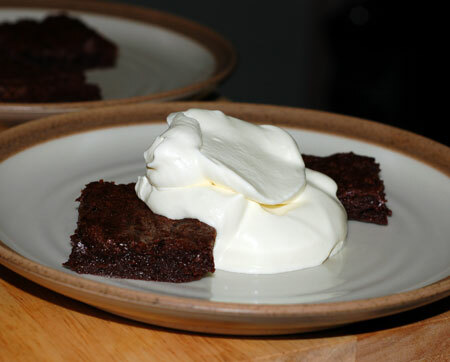 No other garnish necessary, we scarfed down melting dollops of the silky stuff over warm brownie squares (Jeremy even managed it while balancing a wide-eyed, windmilling Nolan), and it was a perfect way to end the evening… at about 11:45pm, as it so happened. Place the white chocolate in a large batter bowl and set a mesh strainer over it. Meanwhile, in a medium saucepan, heat the milk, sugar and salt until the sugar dissolves. In a small bowl, whisk together the egg yolks and temper them with the warm milk mixture by drizzling about half of it into the yolks very slowly while continuing to whisk. Return the yolk-milk mixture to the saucepan and continue to cook over medium heat, stirring constantly until the custard thickens enough to coat the back of a spoon. Remove from the heat and pour through the mesh strainer into the bowl with the white chocolate. Stir until the white chocolate melts, then stir in the cream. Place the bowl in an ice bath and continue stirring until it comes down at least to room temperature, then chill thoroughly in the refrigerator before freezing in an ice cream machine.